It’s a sad fact of life in Vermont that our best and brightest are often forced to seek their fortunes away from home. The so-called “brain drain” is not unique to the state’s workforce; it applies in a variety of arenas, including music. As nurturing and productive as our cozy little music scene is, some folks simply need to get outta town to realize their full potential. And so it’s all the sweeter to see our hometown boys (and girls) make good. 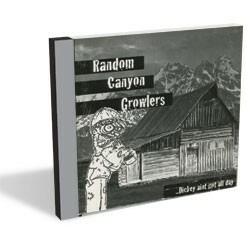 Random Canyon Growlers hail from Jackson Hole, Wyo., but trace their origins to Randolph, Vt. Centered on the songwriting and picking talents of childhood friends David McMeekin and Jamie Drysdale, the band serves up fiery, pop-inflected bluegrass that do-si-dos the line where custom meets contemporary innovation. On their debut album, …Dickey Ain’t Got All Day, the Growlers explore a variety of grassy terrain, from old-school back-porch pickin’ to jazzy instrumental newgrass to Avett Brothers-styled punk-grass. Though at times stylistically unwieldy, the tunes generally stay true to the genre’s vaunted traditions while unabashedly playing with them. As a songwriting tandem, McMeekin and Drysdale complement each other well. Guitarist and vocalist Drysdale is definitively informed by pop, especially on cuts such as album opener “With You Beside Me,” the brooding “Blood Whistle” and Vermont-homage “Keep Your License Plates Green.” Meanwhile, banjoist and vocalist McMeekin grounds the band in its bluegrass roots. Tunes such as “Don’t Ask That Question,” the rousing “Afraid to Go Home” and classic rambler “Alaska Basin” exhibit a clear reverence for the giants of the genre. The collection of tunes is bolstered by excellent instrumental turns from fiddler Bryan Paugh, lead guitarist and mandolinist Jon Degroot, and bassist Matt Donovan. The album’s only real flaw has nothing to do with music. It closes with eight brief “bonus tracks,” supposedly in tribute to bluegrass greats such as Doc Watson, Roy Acuff and Alison Krauss, among others. But instead of songs or studio outtakes, the tracks comprise random and generally boring riffs between McMeekin and Drysdale about skiing and touring. Let’s just say, comedians they ain’t. But they sure can pick. Random Canyon Growlers play a homecoming show at the Chandler Music Hall in Randolph on Friday, August 5.